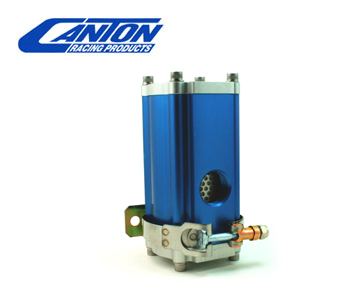 The Canton Racing Products canister oil filter has a 6" tall remote housing, with a 4-5/8" synthetic fiber element. The taller 6" filter can hold more contamination because of it’s size and therefore doesn’t need to be changed as often. The housing is made from a light weight 3-1/4" aluminum square extrusion, 1-1/16" -12 straight o-ring ports, and a removable top cap that allows for easy and mess free element replacement. The filter has a blue anodized body and a clear anodized end cap. A stainless steel mounting clamp is included. The filter element (replaceable) is built for superior filtration, flow and durability than standard oil filters. The filter is made from a synthetic media that is unaffected by moisture and can filter down to 8 microns without clogging or restricting flow. Remote oil filter kits are also available for most popular filter applications. Kits contain a billet remote CM oil filter housing, a CM high flow fine filtration filter element, a 90 degree rotating billet aluminum block adapter, 8 feet of stainless steel braided hose and all of the necessary fittings.